Another first for me on Sunday....quine (keen). 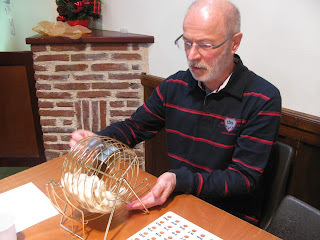 It's French bingo, but without letters. You buy cards...Christiane, as you can see, plays six at a time. I only bought three, knowing my pitiful French would be stretched at that. The object is to cover five numbers in a horizontal line. For the second round, you keep your first numbers, but need to have two lines to win. Third round, the entire card must be filled. 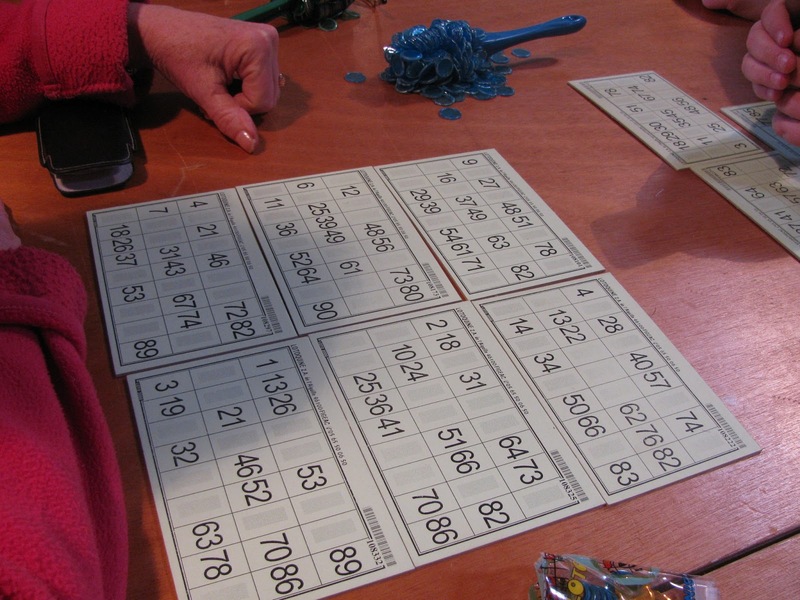 There are a couple of variations to keep the number drawing interesting. The prizes were great...bottles of wine, big bags of grocery staples called filet garni, gift baskets from the local gourmet shop, flowers from the town florists. Although I didn't win anything, it was a lot of fun. Beginning at 2:30 pm, the last prize was awarded near 6:30 pm making for a long afternoon! It was fabulous practice for my French number recognition ability. Christiane did help a little as she'd repeat the number in English each time, but usually I had it figured out by then. As the afternoon wore on, though, I found my brain on overload. it was tres fatiguee. I especially had difficulty discerning between trente and quarante (perhaps Jean-Pierre, our number caller, was becoming fatigued as well and not enunciating as clearly?) and those pesky big numbers in the 70s, 80s and 90s caused me to struggle. It's hard enough to remember the little numbers, but when you have to multiply and/or add to come up with the figure...well! I want one of these! It's a magnetic wand that gathers up the colorful plastic number markers which have a thin wire embedded in them. I'm easily pleased, huh? Jean-Pierre, our esteemed number caller. What great fun. That little wandy-thing looks awesome... (I wish there was something like that for the legos that are always all over the floor here). I can imagine the language bit is quite challenging in a fast-paced game! In all our 15+ years here, we've never been to Quine. Ah, those French numbers. But I'm sure it was good practice.